Although I knew that Brazilian weddings are huge, I had no idea what to expect when arriving at our almost last destination in Brazil: Curitiba. On the private acres of our generous hosts (including three houses of relatives, own forest and horse stables) a tent is being built. A tent? It’s more like they're building a rock star concert stage (think Beyoncé), with a chapel built from scratch, dance floor for 800 people, buffet, bar, lounge and toilets that are bigger and more luxurious than in the Four Season's. Ah, and there is a glittery Miu Miu heel indicating the ladies room which I definitely would have snatched away (so beautiful!) had I known where the second one was hidden (it was my size!). And the party people! So glamorous and stylish I guess every red carpet would turn green with envy. Had to plunder the mother of the bride's closet (thank you Danie, I will be forever grateful), since the flowery dress I brought suddenly didn't seem like such a good idea (patterns ladies, so NOT Brazilian wedding....) and I knew that the designer of the brides-dress (couture!) would be present personally. And yeah. That was all before I ruined my new pair of heels by dancing the night away with all the happy wedding crowd in the most beautiful setting ever. What a night to remember! P.S. : Am still searching fot that second Miu Miu, but psssssst.... let's keep that our secret, OK? Today’s shoes are Schutz, a Brazilian brand to keep an eye on! It has been a beautiful, beautiful summer so far with loads of cheerful events and possibilities to drag out the fancy wardrobe, the most glamorous (aka impossible to wear) heels, blowing all remaining budget for facials, hairdressers and spray tans to look fabulous and: celebrating your heart out. After months of planning and anticipation our mates Kim&Alex finally got hitched: my very first dutch wedding to attend. And what a day it was. Such a magic location, such a wonderful bride and groom (am still in awe about the blue laces all the guys wore: a new trend??? ), so many lovely people, so much love in the air, and well.... such a heavy bout of rain as well. I guess also the sky had to pay tribute squeezing out that little tear which we all had in our eyes. After all that heavy partying, dancing, toasting and cheering, you will understand that some rest is needed. With beautiful memories in mind, I am off for a (heel) retreat aka well deserved holiday aka to hell with the inches and HELLO shabby T’s, bikini and Flip Flops. Today’s shoes are Stuart Weitzman (me) and Nina Fiarucci (the bride). This post is dedicated to the lovely freshly baked Mr. and Mrs. Floor-Vrielink. Thank’s for a wonderful experience! Oh weddings, how I love you! The cherry on a relationship, sealing the love-deal (hopefully) forever, being celebrated by a huge party gathering all friends... what’s not to like? It’s the only day that it’s not ridiculous to cry like a baby all the time (especially as the bride walks down the aisle) and where waterproof mascara and a hanky will do as the perfect accessories (nothing else will fit your tiny clutch anyway). 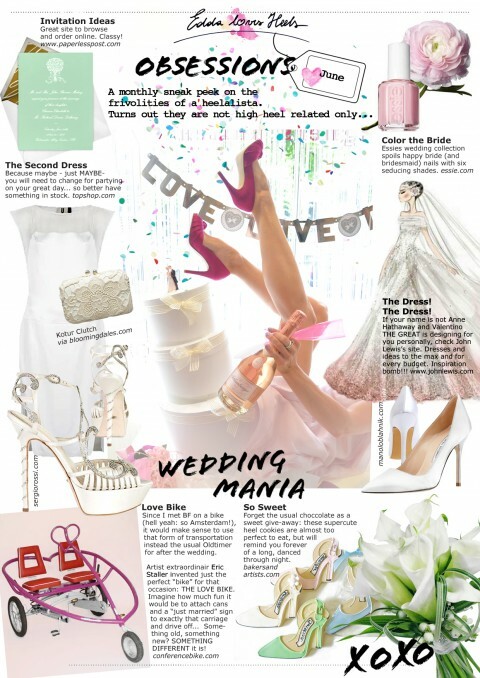 With two of my favorite ladies getting hitched this summer (countless mail-conferences about heels and back-up flats, dresses, bridal bouquets, locations etc), I think it’s only appropriate to share some of my favorite ideas for the big day. Am actually regretting that I’m not a) Martha Stewart, being able to decorate the most beautiful wedding settings all the time, or b) Owen Wilson, or Vince Vaughn so I could attend the fabulous event (of others!!!) more often. Just one note: it’s not considered good manners to dress more beautifully than the bride, so tone it down a bit, and never EVER sit anywhere near the wedding cake. Just saying. My baby sister got married last weekend (aka an overdose of romantic feelings caused delay of post...sorryyyyyy), and due to the exceptional event I have to put someone else’ s heels online just for once. All in honor of the bride of course. And how perfect everything was. The handsome groom, the pretty bridesmaids (why have one if you can have four...) the perfect setting... and the paddle stones. Had to ditch my 10 inches -oh- yeah, loved them but combination of 30 degrees and balancing on rocky ground caused a “Kim Kardashian”-moment (aka swollen feed to the max, aka why should you watch this... ever... ). Not my baby girl though: She wore her high heels all night long (and by all night long I mean until 6 o clock in the morning...) and I couldn’t be more proud. This is to the bride and her lovely shoes: please live happily ever after. Heel-spect! It’s almost inexcusable how I have neglected my shoe-collection (and therefor outfit and styling of any kind) the past weeks, but have been very busy organizing a surprise for BFF who is getting hitched this weekend in Austria. We share a passion for drama and theatrical scenes (not that either of us would EVER act like that...) so of course it had to be something special. Since my last attempt to delight an audience resulted in my being banned from any kind of stage forever, I spent long hours in the studio excelling in preparatory work - and I can totally share now because as you read this my sweet friend will be fiddling with her veil and definitely not checking her Facebook account. My gorgeous boots fit the theme perfectly: L-Enfant Terrible it is, and I’d say bring on the lights: am totally ready to delight an audience... again. Did I mention something with “drama” in the beginning?